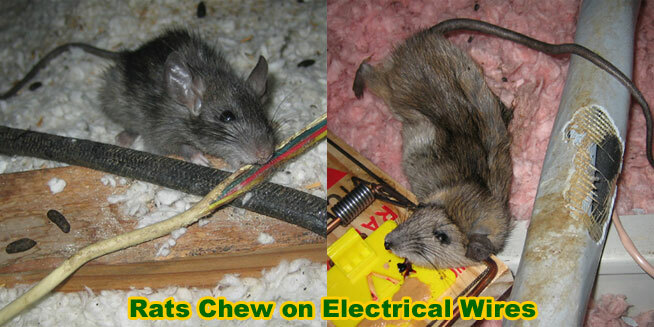 Rat Damage To Home, Electrical Wires, Pipes, Eaves, Car - What Can Rodents Destroy? Yes, rats can be very destructive. Outside of the health risk they pose, and their tendency to soil and contaminate food, they are also gnawing rodents, and they often cause damage to several parts of a home or attic. You might only be bothered by the noise at night you can hear, but they are causing damage you can't see. 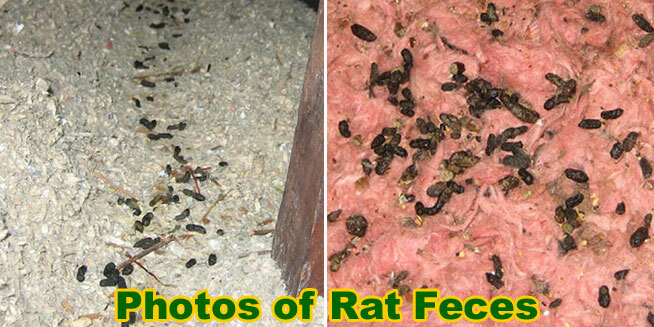 In this photo, we can see all sorts of rat damage. Biohazard droppings by the thousand, brown grease stains on everything, chewed wires, attic insulation that has been urinated on, trampled down, and moved for nesting material. 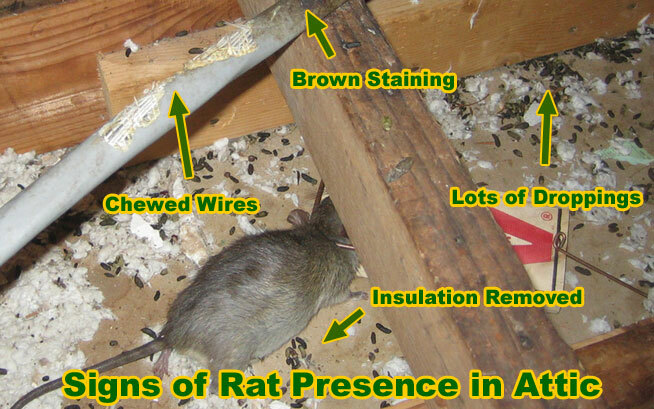 A bunch of rats, over time, can almost destroy an attic, create a health hazard, decrease the insulation value, short out electrical wires, chew open re-plumbing jobs and cause water damage, and cause a fire risk via those electrical wires. Rats do chew on eaves. They often chew holes to gain access into the soffit and eaves. Once inside, they can chew on wires or pipes, and leave droppings everywhere. I've seen, and have some good photos of, rats that have chewed wood beams in attics and eaves down, almost all the way through! This is a big problem, for two big reasons - electrical outages, and fire hazard. I've seen both. I've even been to a couple cases in which rats chewed on security system wires, and set off the home alarm! Rats an mice are rodents who like to gnaw, and they really seem fond of wires, for some reason. Rats do often nest in car engines. If you are having automobile trouble, it's possible that a rat nested in the engine and chewed some of the electrical system. I've seen this happen a few times. It can be kind of hard to keep rats out of cars, since the bottom is open and all. An obvious solution is the park the car in a closed garage. Another solution is to drive it often, which will prevent rats and mice from getting all cozy and nesting in the automobile. But if you already have a problem with rodents in the car engine, try spraying super hot habanera sauce, or a product called Ropel, on the wires, and that will discourage chewing. Of course, general rat prevention and rat trapping in the area will help as well. You can also find and remove nesting debris from the car engine. Read more about How To Get Rats Out Of Your Car. Although I wrote this site with rats in mind, such as the Roof Rat and Norway Rat, the same principles apply to other rodents, such as the house mouse. Mice behave very similarly to rats, they're just smaller. Email me if you have any questions about mouse damage, or the damage problems mice can cause.